Diagnosing cancer early on can greatly improve a patient’s prognosis. Biopsies and screening are the most common and accurate means currently used to identify cancer markers in the blood. But samples have to be sent to central laboratories for analysis, making the process expensive and time-consuming. Procedures for taking samples can also be invasive and distressing for the patient. Biosensor technology is a continually evolving area of research. More efficient, sensitive and stable devices are being developed all the time. Yet, very few of these devices make it to clinical trials for cancer diagnosis. A new collaborative project between Bath and the University of São Paulo (USP) is developing novel diagnostic tools to spot cancer early on. 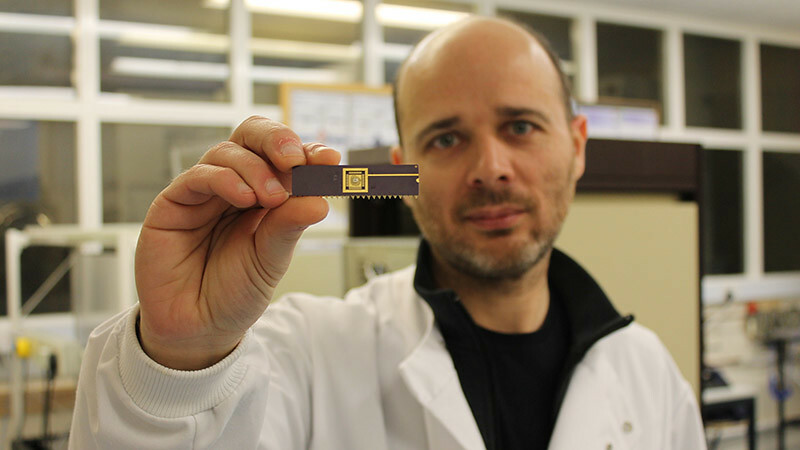 The teams, led by Dr Pedro Estrela (Bath) and Professor Marcelo Mulato (USP) are creating sensors that will accurately detect and measure early-stage cancer biomarkers via point-of-care testing. The research integrates existing electrochemical and semiconductor-based biosensors developed by the two universities for in vitro cancer diagnostics. The teams are using their combined expertise to develop techniques that enhance the sensitivity and selectivity of the sensors. The result will be innovative, robust and ultra-sensitive biosensors that detect biomarkers specific to both prostate and breast cancer. Another device in development will detect panels of microRNAs in the blood, which are linked to the development and progression of cancer. The biosensor will analyse 'molecular fingerprints' of microRNAs to reveal precise and important information about the stage and subtype of prostate cancer. The information could help determine the best choice of therapy for individual patients. We are funding this collaboration with São Paulo Research Foundation (FAPESP) through SPRINT - São Paulo Researchers in International Collaboration. The two-year project supports ongoing research and cooperation between the two universities under the umbrella of biosensor technologies. It draws on elements from Dr Estrela’s work on prostate cancer and Professor Mulato’s on breast cancer. Since the project started in November, researcher visits have taken place between Bath and São Paulo, opening up an exchange of knowledge. The project promises to lead to further collaborations to advance biosensor research for cancer diagnosis in the future.